The Komen San Diego team is ready for the New Year! With health being top of mind, we equip ourselves with some cool and user-friendly apps to help us maintain sanity during the busy year. Join us and prioritize your health. See your doctor when something just doesn’t feel right, trust your gut and listen to your body! Feeling overwhelmed or having a stressful day? Nothing like a power walk to shake it off. Nike Run Club gives you everything you need to run and/or walk better and more often. It includes GPS tracking of your outing, audio-guided workouts, and weekly and monthly distance challenges to keep you motivated. It also includes customized coaching plans that fit your goals and adapt to your progress, and nonstop motivation from your friends. Working in an office space means lots of open-air conversations, back-to-back meetings, visitors coming in and out. Remember to take a moment to breathe. A meditation and mindfulness app to help you manage anxiety, lower stress and sleep better. Calm is the perfect mindfulness app for beginners, but also includes hundreds of programs for intermediate and advanced users. A breast cancer diagnosis may be one of the toughest things in life. Be informed and get support from others going through it. Kiddos are full of energy and require your full attention! For the times when you need to make a quick trip to the laundry room or empty the dishwasher, technology may just be in your favor. A safer online experience for kids. 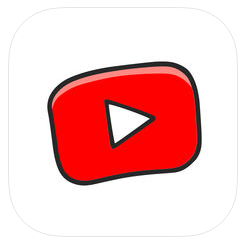 YouTube Kids was created to make it safer and simpler for kids to explore the world through online video – from their favorite shows and music to learning how to build a model volcano (or make slime), and everything in between. There’s also a whole suite of parental controls, so you can tailor the experience to your family’s needs. There’s nothing like fresh air. Explore your city and get your move on. What’s your ETA? Where are you? Just check the app. Life360 is the world’s leading real-time, location-sharing app, and is the best way to coordinate with family and friends. Get automatic notifications when your family comes and goes from home, work and school, and when they complete drives. Most of us struggle with this question –Where did my money go? This app helps you take control of your budget and expenses. Clarity Money is here to partner with you along your financial journey. It uses data science and machine learning to analyze your personal finances and help you make smarter decisions about your budget and spending. We hope these are helpful to you. Please comment and share with us some of your favorite apps or tools that help give you peace of mind. If you or a loved one is in need of counseling and/or support, please call the Komen Helpline at 1-877 GO KOMEN (1-877-465-6636).